The four Shakti Peethas of Maharashtra are Tuljapur enshrining Bhavani, Kolhapur enshrining Mahalakshmi, Mahur enshrining Mahamaya Renukaand Saptshringi enshrining Jagadamba. Other Shakti temples in the state are those at Ambe Jogai and Aundh. Kolhapur is located in Kolhapur district and is well connected with Pune, 240 km north. It is on the national highway between Bangalore and Pune. It is situated on the banks of the Panchganga river and is full of ancient temples and shrines. Legends: The Karavira Mahatmya states that Vishnu resides in the form of Mahalakshmi at Kolhapur. Legend has it that Kolhasura, a demon that tormented the Gods and other beings, was destroyed by Mahalakshmi here at Karavira, and that the spot of his death became a thirtha and that she took abode here in a shrine which constitutes the temple today. (Legend also has it that Parvati - Kolhambika destroyed the demon Kolhasura at Tryambakeshwar). History:: Although several parts of the temple are of the second half of the second millennium CE, epigraphic references place the deity in the 7th century CE, and the temple in the 10th century CE. For a period in the interim, this temple had fallen out of worship and the image of the Goddess was housed elsewhere. Worship was restored in the year 1715 after the Marathas rose to power. The Temple: The main entrance Mahadwara of the temple is the western entrance. Upon entering the Mahadwara one is confronted with several deepamaalas on either side, and enters the Garuda mandap with square pillars and foliated arches of wood, characteristic of Maratha temples. This mandap dates back to the 18th century. An image of garuda faces the sanctum. Another stone mandap, on a raised platform enshrining Ganesh, also faces the sanctum. Following this is the mandap with three shrines facing west. 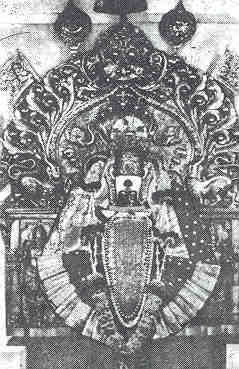 The central one is that of Mahalakshmi and the two on either side are those of Mahakali and Mahasaraswathi. The temple complex exhibits mortarless construction echoing the style of the early Deccan temples. Also to be noted here are the horizontal mouldings and the vertical offsets which create a rich light and shade pattern. Also seen in this temple is a rich display of sculpture of figurines in dancing poses, musicians, gods and goddesses. The three sancta have rather simple shikharas of brick and mortar dating back to the 19th century. The image of Mahalakshmi carved in black stone is 3 feet in height. The Shri yantra is carved on one of the walls in the temple. The sanctum is designed such that once a year, the setting rays of the sun fall on the face of the image of Mahalakshmi for a period of 3 days in the months of Pisces and Leo. Above the Mahalakshmi sanctum is a shrine with a Shivalingam and a nandi. The devakoshtas house Venkatesha, Katyayani and Gowri Shankar - facing the north, east and the south. There are a number of subsidiary shrines in the courtyard to the Navagrahas, Surya, Mahishasuramardini, Vitthal-Rakhmai, Shiva, Vishnu, Tulja Bhavani and others. Some of these images date back to the 11th century, while some are of recent origin. Also located in the courtyard is the temple tank Manikarnika Kund, on whose bank is a shrine to Visweshwar Mahadev. Worship: Five worship services are offered each day here. The first one is at 5 am, and it involves the waking of the deity with a Kakada - torch, to the accompaniment of hymns. The second worship service at 8 am involves the offeirng of the Shodashopachara pooja consisting of 16 elements. The afternoon and evening services and the Shejaarati pooja constitute the three other services. A festival image of the deity is taken out in procession around the temple courtyard each Friday, and on full moon days.